Given the latest CRP conversation, this week’s post takes an updated look at CRP trends and walks through a simple thought experiment to provide insights on what a reduction in U.S. crop production acres might look like. The CRP program was born in the post-1980s farm financial crisis as policy makers worked to shore-up the farm economy. The program had many appeals: a long-term source of cash flow for farmers through rented program acres, a long-term means of banking (or idling) acres to curtail burdensome crop production, and numerous wildlife and conservation benefits. The program began enrolling acres in 1986 and quickly expanded to more than 30 million acres by 1990 (Figure 1). CRP acres initially plateaued at 35 million acres from 1993 to 1995. After the 1996 Farm Bill, acres under contract briefly declined before expansion resumed and the program peaked at 36.8 million acres in 2007. For a host of reasons – including strong farm incomes, high crop prices, and fiscal cutbacks in Federal budgets – CRP acres have contracted since 2007. In 2016, after a decade of declines, the program currently has 23.9 million acres enrolled. From 2007 to 2016, the program contracted by 12.9 million acres (or by 35%). These reduced acres have been put back into production in one form or another – row crop production, hay, pasture, etc. Overall, the release of CRP acres coincides with an overall increase in acres of production in the U.S. and globally. The current Farm Bill has CRP acres capped at 24 million acres. 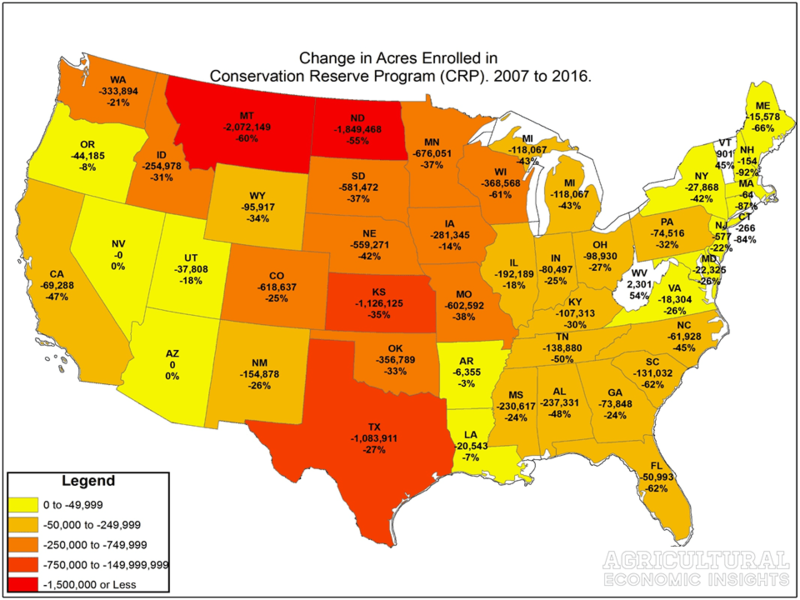 To take a closer look at the CRP program’s contraction, Figure 2 shows state-level changes in CRP acres from 2007 to 2016. In four states (Kansas, Montana, North Dakota, and Texas), declines exceeded 1 million acres. Furthermore, many states experienced a large decline in the share of total program acres. In Montana and Wisconsin, for example, program acres declined by 60% or more. Figure 2. Change in CRP acres (by state) from 2007 to 2016. Third line of data: percentage change in CRP acres from 2007 levels. Data: USDA Farm Service Agency. What if the CRP Acres Increased? Anytime an expansion of CRP acres is suggested, many wonder if the acres moving out of production would be significant enough to improve farm-level crop prices. Of the hundreds of millions of acres planted each year in U.S., 12.9 million additional CRP acres – as an example- seems like a drop in the bucket. To fully assess the impacts of additional CRP acres a complex economic model would be needed to account for the many factors affecting acreage, production, price, and demand. Additionally, one must also be concerned with impacts in other countries – does a CRP expansion encourage an increase in acres elsewhere? Such a robust project is beyond the work Brent and I do here on this website. The goal of this post isn’t to directly answer the impacts of an expanded CRP program. However, this post will instead provide insights by considering what a 12.9 million acre reduction of corn, soybeans, and wheat acres might look like. To do this, the 12.9 million acre reduction was split among states based on CRP reductions (see figure 2). Furthermore, the decrease in corn, soybeans, and wheat acres within a state was proportionate to 2016 plantings. For example, the total acres of corn, soybean, and wheat in Kansas were reduced by 1.12 million acres. In 2016, wheat accounted for 48% of the total corn, soybean, and wheat acreage. For this exercise, Kansas wheat acres were assumed to be reduced by 537,000 acres. The same process was repeated across each state for the three crops. When appropriate, USDA reported 2016 state-level yields were used. To reiterate, the purpose of this exercise was not to provide a definitive estimate on the impacts of an expanded CRP program. Rather, this thought exercise considers how a 12.9 million acre reduction of corn, soybean, and wheat acres might play out. This distinction is important as this post does not consider any price affects, or how associated changes in commodity prices –because of changes in acreage- would impact U.S and global planting decisions and grain usage (demand). When one looks at all of the states and does the same calculations as those for Kansas some interesting ideas emerge. The first point to make from this exercise is that a large reduction of wheat acres is expected. Nearly 6 million acres, or 46% of the total 12.9 million acres, were reduced from wheat. This is a result of CRP reductions occurring in states with large shares of wheat acres. Of the remaining acre reductions, 3.8 million came from corn and 3.1 million came from soybeans. In Table 1, the estimate national-level impacts in 2016 (using USDA estimated yields and usage) are shown. Across all states, the 6 million acre reduction of wheat acres reduced acres and production by roughly 12%. The impacts on acres and production of corn and soybeans were much less (-3% to -4%). These small changes in corn and soybean production (-3% to -4%) are often noted when hypothesizing that an expanded CRP program would have limited impacts on commodity balance sheets and prices. However, the impacts on ending stocks must also be considered. This thought exercise found the reduction of corn, soybean, and wheat acres would reduce ending stocks quite dramatically. Soybean stocks reduced by about one-third while corn contracted 26% and wheat shrank 24% (Table 1). The ending-stock-to-use ratio is often a better way to report ending stocks. Ending-stocks-to-use for corn contracted from nearly 16% to less than 12%. Soybeans shrank from nearly 11% to slightly more than 7%. Finally, burdensome wheat stocks contracted from 52% to 39%. Again, changes in usage were not accounted for in this is a simple, back-of-the-envelope exercise. It’s difficult to say exactly how commodity prices would change under these scenarios. However, the changes in ending stocks – especially relative to use – are significant and would likely provide support for higher prices. Even when considering the impact for only a single year (2016), it seems the grain outlook would have less burdensome ending stocks. Table 1. Estimated Changes in Acres, Production, and Ending Stocks (2016). While this post did not estimate the impacts of an expanded CRP program, it does provide some insights on how a reduction in cropland acres might play out. First, states with the largest declines in CRP acres have a large share of acres planted to wheat. With that said, there are also sizable plantings of corn and soybeans as well. 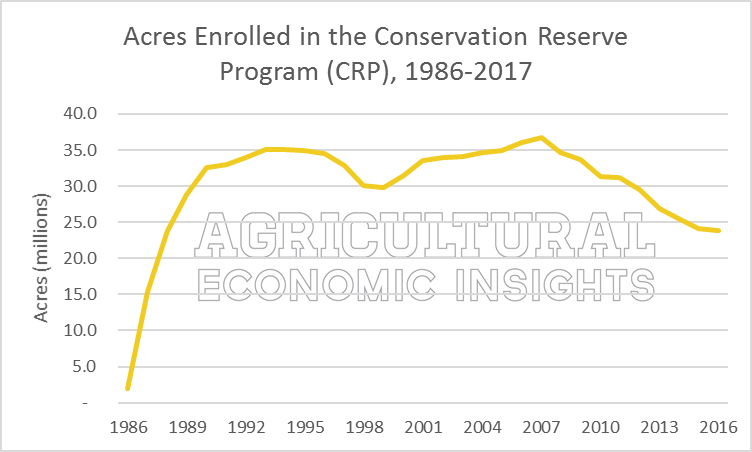 The second insights is that, as many would expect, an expansion in the CRP program would have relatively small impacts on total crop acreage and production. In the simple thought experience outlined in this post, the impacts were as small at -3% to -4% for corn and soybeans to as much as -12% in wheat. This get us to the third insight: small changes in acres and production can have significant impacts on ending stocks. Without considering changes in usage (or demand), changes for corn, soybean, and wheat were all large. As debate on the 2018 Farm Bill gets underway, pay close attention to how discussions and decisions regarded CRP play out. Congressional members have preliminary suggested increasing the CRP cap to 30 million (up 6 million acres; South Dakota Senator John Thune) or 40 million acres (up 16 million acres; Minnesota Representative Collin Peterson).